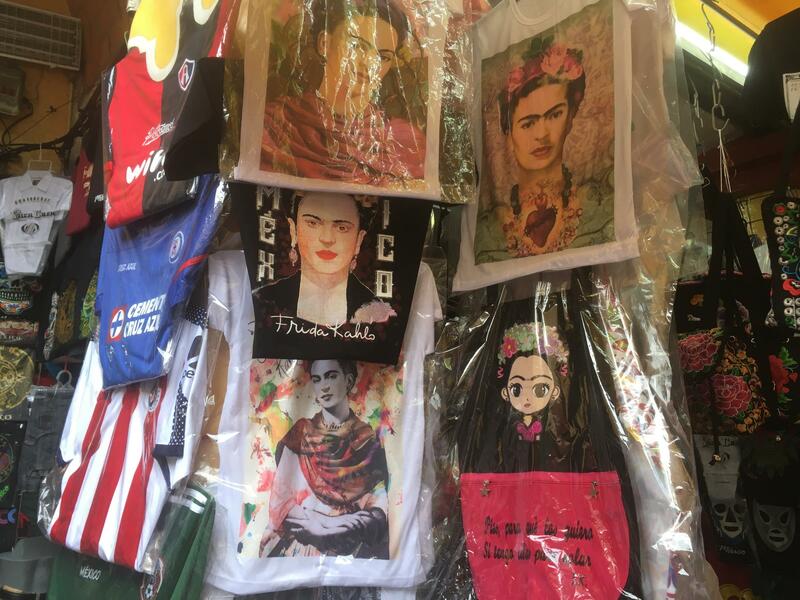 In Frida Kahlo's home town of Coyoacán, near Mexico City, the artist's image — modeled off of her own self-portraits — has become the ultimate marketing tool. The Frida Kahlo Corporation began producing Frida Kahlo Tequila after it bought the rights to Frida's image in 2005 from the painter's niece, before her death in 2007. In a few short decades, Frida Kahlo has gone from mainly known as the wife of of prominent Mexican painter Diego Rivera to becoming a pop culture icon. These days, she has far surpassed her husband's fame. Converse, Forever 21 and Zara have sold shoes and clothes with Frida's image. But it's not just the commercial giants: In her Mexico City neighborhood of Coyoacán, Fridamania is on full display. T-shirts, dolls, notebooks, magnets, dresses and hats brandishing the late artist's face line outdoor kiosks. Frida gear is an important source of income for countless vendors who market to tourists. Pedro Hernandez, who runs one of the booths, says everything carrying Frida's image sells quickly. But he doesn't actually know about her. "But she must be important, because if not, she wouldn't be famous," he says. Frida's searing self-portraits — depicting her lifelong struggle with pain, and simultaneously, her fortitude — turned her into an iconic figure after her death in 1954. But a recent lawsuit to stop the sale of a Barbie doll in Frida's likeness raises new questions about whether the mass commercialization of Frida honors or betrays her independent spirit. The toymaker Mattel launched the Frida Kahlo Barbie as part of its "inspiring women" series. But some of Frida's descendants say the doll betrays Frida's very essence by eliminating her signature unibrow, lightening her eyes and thinning her hips. "The question really is who controls how people are interpreted. And when you can be made into a cultural icon," says Rebecca Tushnet, who teaches intellectual property law at Harvard University. She says courts in the U.S. have increasingly allowed celebrities to control the commercialization of their images. But when the celebrity is dead, the question of who owns those rights can be murky. In Frida's case, the rights to her image are claimed by the Panama-based Frida Kahlo Corporation. "There's something fundamentally disturbing about publicity rights, to the extent that they are held by entities that may have no real relationship to the celebrity," Tushnet says. "And still these entities claim the right to control what's commercialized — not to prevent commercialization but actually just profit from it." The Frida Kahlo Corporation says it bought the rights to Frida's image in 2005 from the painter's niece, Isolda Pinedo Kahlo, who then became one of its owners until her death in 2007. 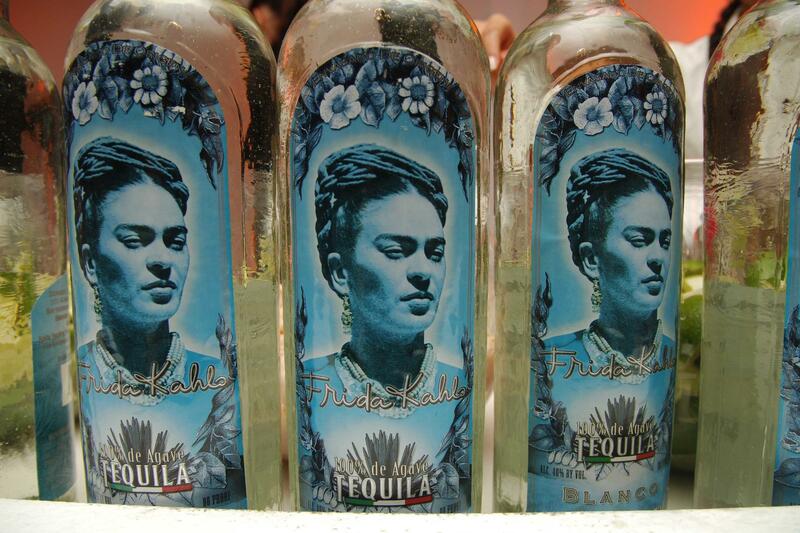 It has since sold Frida's image far and wide, even launching a high-end tequila with her picture on the label. "It's an honor to have a piece of Frida Kahlo that will inspire you day to day," says Beatriz Alvarado, the corporation's spokeswoman. "We don't have Frida now, so we are taking her image everywhere. Having her be the center of attention to many women who need that strong female personality to follow." Alvarado says the Frida Barbie doll will ensure that her story lives on. And, she adds, the Barbie does have a unibrow — it's just very faint. "The idea is to bring Frida to the new generations that are just 6 to 10 years old," she says. "And to share and spread that, we should be our own muse." But the daughter of Frida's niece Isolda, Mara de Anda Romeo, claims she owns the sole rights to the artist's image — not the corporation her mother helped create. De Anda Romeo declined to comment for this story. In April, a Mexico judge sided with her, blocking the sale of the Frida Barbie in the country. The ruling doesn't extend to the U.S.
Barbie or not, the question of whether Fridamania honors or devalues the painter sparks strong feelings. David Martín Del Campo wrote a biography of Frida. "Frida was a militant, anti-capitalist, communist and feminist. And what they celebrate now are the superficial aspects of her and the way she dressed," Martín Del Campo says. "The mass merchandizing of her image trivializes her, is in bad taste, and, finally, is just commercial exploitation." Even so, Martín Del Campo says Frida sought publicity while she was alive. And, he adds, "She would probably like that her legacy lives on after her death, and that her artwork is now more appreciated and celebrated by the public." In a few short decades, the Mexican painter Frida Kahlo has gone from obscurity to pop-culture icon. Forever 21 and Zahra have sold clothes with her self-portraits. But a recent lawsuit to stop the sale of a Barbie doll in Frida Kahlo's likeness raises new questions about whether the commercialization of Frida Kahlo honors or betrays her independent spirit. From Mexico City, Emily Green reports. EMILY GREEN, BYLINE: Fridamania (ph) is on full display in her Mexico City neighborhood of Coyoacan. T-shirts, dolls, notebooks, magnets, dresses and hats with her image on it. Pedro Hernandez runs one of the booths. He says everything with Frida's image sells quickly. GREEN: Hernandez says Frida gear is an important source of income. But he doesn't actually know about her. GREEN: He says, "she must be important, because if not, she wouldn't be famous." Frita's self-portraits depicting her lifelong struggle with pain, but also her fortitude, turned her into an iconic figure. But has she become too famous, too commercialized? The toymaker Mattel launched the Frida Kahlo Barbie as part of its Inspiring Women series. But some of Frida's descendants say the doll betrays Frida's very essence by eliminating her signature unibrow, lightening her eyes and thinning her hips. Rebecca Tushnet teaches intellectual property law at Harvard University. REBECCA TUSHNET: The question really is, who controls how people are interpreted? And when can you be made into a cultural icon? GREEN: She says courts in the U.S. have increasingly allowed celebrities to control the commercialization of their images. But when the celebrity is dead, the question of who owns those rights can be murky. In Frida's case, the rights to her image are claimed by the Panama-based Frida Kahlo Corporation. TUSHNET: There is something fundamentally disturbing about publicity rights, to the extent that they are held by entities that may have no real relationship to the celebrity. GREEN: The Frida Kahlo Corporation says it bought the rights to Frida's image in 2005 from the painter's niece, Isolda, who then became one of its shareholders until her death in 2007. It has since sold Frida's image far and wide, including on a high-end tequila. Beatriz Alvarado is the corporation's spokeswoman. BEATRIZ ALVARADO: It's an honor to have a piece of Frida Kahlo that will inspire you day to day. GREEN: Alvarado says the Frida Barbie doll will ensure that her story lives on. And, she adds, the Barbie does have a unibrow. It's just very faint. ALVARADO: The idea is to bring Frida to new generations that they're just 6 to 10 years old, and to share and spread that we should be our own muse. GREEN: But the daughter of Frida's niece, Isolda, claims she owns the sole rights to Frida's image, not the corporation her mother helped create. She declined to comment for this story. In April, a judge in Mexico sided with her and blocked the sale of the Frida Barbie in Mexico. The ruling doesn't extend to the U.S. Barbie or not, the question of whether Fridamania honors or devalues the painter sparks strong feelings. David Martin Del Campo wrote a biography of Frida. DAVID MARTIN DEL CAMPO: (Speaking Spanish). GREEN: He says Frida was a militant, anticapitalist, communist and feminist. And what they celebrate now are the superficial aspects of her and the way she dressed. Even so, Martin Del Campo says Frida sought publicity while she was alive. MARTIN DEL CAMPO: (Speaking Spanish). GREEN: And, he says, she would probably like that her legacy lives on after her death. And her artwork is now more appreciated and more celebrated. As for those of you in the U.S., for now, you can buy a Frida Kahlo Barbie doll in the Wal-Mart near you. For NPR News, I'm Emily Green in Mexico City. Transcript provided by NPR, Copyright NPR.